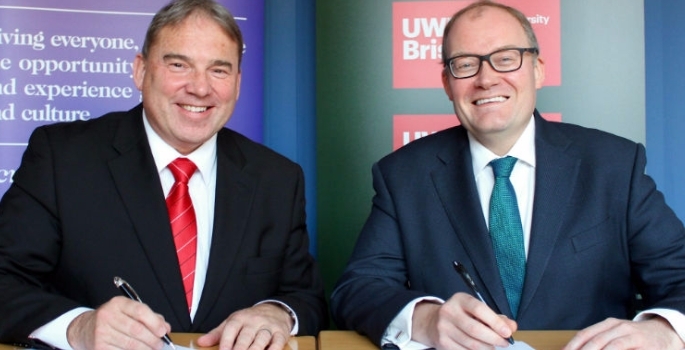 The University of the West of England (UWE Bristol) and Arts Council England have signed a Memorandum of Understanding as part of a new strategic partnership. The Memorandum provides a framework for new strands of collaborative activity between the University and the Arts Council including a shared commitment to developing the creative economy, finding and encouraging new talent, and working together to establish a National Centre for Arts Technology in Bristol. UWE Bristol and Arts Council England are mutually committed to supporting the arts and creative industries in the city, championing talent development, diversity and skills. The partnership will initially last five years. Louise Jennings, Associate Dean of Strategic Partnerships in UWE Bristol’s Faculty of Arts, Creative Industries and Education, said: “The signing of the Memorandum of Understanding is a really exciting moment and acknowledges the anchor roles that UWE Bristol and Arts Council England have in the Bristol city-region to support place making and creative talent development.